PBLs, IL-2, HSP70, HepG2 hepatocarcinoma, Antitumor immunity. Costimulatory signal is necessary to stimulate the response of effective cellular immune [1-3]. The B7 family and other costimulatory molecules play an important role in the process of costimulatory signal transmission [4,5]. The binding of CD28 and B7 molecules on the surface of T cells seems to provide the primary costimulatory signal for T cell activation [6-8]. Various membrane surface molecules are located onto T cell surface. These molecules guarantee the antigen recognition of T cell, interactions with other immune cells and receiving signal stimulation [8-12]. Also, they provide an important fundamental for the identification and isolation of T cells and T cell subsets [7,11,13]. Due to the generation and transmission of costimulatory signals, the apoptosis of target cells can regulate the immune response artificially [14-16]. PBLs might act as a ligand for reverse transmission of signals to affect tumor immunity correspondingly [17-19]. In order to investigate this new mechanism of PBLs molecules, hepatoma HepG2 cell strain of KM mouse was used to build a solid tumor model in thigh muscle to study the inhibitory effect of PBLs molecule on HepG2 solid tumor and the influence on immune system of tumor bearing KM mice. The cell strain of HepG2 hepatocarcinoma was purchased from BeNa Culture Collection (Guangzhou, China). Male KM mice (age: 4-6 weeks, weight: 18-22 g) were purchased from Animal Center of Jilin Medical University. Trizol was purchased from Thermo Fisher Scientific. The reverse transcriptase and RNasin were purchased from Tiangen Biochemical Tech Co., Ltd. (Beijing). Taq DNA polymerase was purchased from Shanghai Haoran Company. 5-Carboxylfluorescein diacetate succinimidyl ester (CFSE) and propidium bromide were purchased from Sigma-Aldrich (China). The eukaryotic expression plasmid PBLs and IL-2 were respectively constructed from the full-length cDNA and full-length cDNA of IL-2 inserted into the eukaryotic expression vector pcDNA, which was constructed by our laboratory. Twelve KM mice were taken to conduct the measurements. The plasmid PBLs was dissolved in saline solution and injected into the muscle of left thigh of the mice using in situ injection method (0.1 mg per KM mouse). After injection of PBLs solution, each three mice were killed after 12 h, 24 h, 36 h and 48 h, respectively. RT-PCR method was applied to detect the expression of PBLs in the muscle tissue of KM mice. HepG2 hepatoma cells (1 × 106/mL) were inoculated into the muscle of left thigh of mice (0.1 mL per mouse). The mice were randomly divided into normal saline group (the blank control group), pcDNA group (the plasmid control group) and PBLs group (the treatment group) with 20 mice in each group. Plasmid was injected on alternate day after the second day of inoculation with each injection of 0.1 mL (1 mg/mL) the injection site was the position of inoculated tumor cells. These inoculated mice were dissected after two weeks. The tumor was taken and weighed to observe the growth. Based on above experimental groups, HSP70 group (the treatment group) and PBLs/HSP70 group (the combined treatment group, injection was half for each plasmid) were added with 20 mice in each group, HepG2 hepatoma cells were inoculated with the same method and the same treatment was conduct for examination of synergistic effect of PBLs with HSP70. The tumor mass of xenografted mice was 120 g and after treatment, the mass decreases to 400 mg and 500 mg for experimental and control groups, respectively. After 3rdand 6th day of inoculation, five mice that were randomly selected from normal saline group, pcDNA group and PBLs group, respectively were killed for tumor tissue sampling. To the mice without tumor, the tissue at the position of inoculated tumor cells was taken. To the mice bearing grown tumor with size larger than 3 × 3 mm, the tissue at the junction of tumor and normal muscle was taken. The total RNA was extracted with Trizol reagent for reverse transcriptase reaction. Then 5 μL sample was taken as template from 60 μL reverse transcriptase product to amplify IL-2, IFN- γ and HSP70 by PCR, respectively. β-actin was used as internal reference. There were 40 cycles at the conditions of 85°C for 40 s, 60°C for 60 s, 40°C for 90 s, and 25°C for 120 s, respectively. Gel imaging analysis system was used to analyze the expression level of mRNA and relative expression value was calculated by the following equation: relative expression value (%)=(gray value of amplified bands of the gene to be test/gray value of β-actin gene amplification band) × 100%. After 4th day of tumor cells inoculation, six mice from normal saline group, pcDNA group and PBLs group, respectively were randomly selected for spleen sampling. Single spleen cell was prepared under sterile conditions for the following two experiments: The first experiment is proliferation of spleen cells in vitro. The concentration of mice spleen cell was adjusted to 1 × 106/mL, suspended in culture medium containing 15% foetal calf serum followed by stained with CFSE. The solution was divided into two samples, one added HepG2 antigen peptide and HSP70 protein complex (the final concentration was 0.58 μg/mL). Both samples were transferred to a whole plate (100 μL per hole) at 37°C in an incubator for 7 d. Flow cytometry was used to detect spleen cell proliferation index. The second experiment is spleen cell killing in vitro. Three samples of prepared single spleen cell suspension were taken (without CFSE staining), along with the spleen cells taken from a normal mouse which was used to determine the non-specific killing rate. All samples were cultured in culture medium containing 15% foetal calf serum. HepG2 antigen peptide and HSP70 protein complex (the final concentration was 0.58 μg/mL) was added and cultured in vitro for 7 d as effector cells. HepG2 cells were taken from mouse ascites and cultured in the same culture medium for overnight followed by stained with CFSE as target cells. The effector cells were mixed with the target cells according to a ratio of 30:1 at 37°C, the mixture was cultured in an incubator for 6 h, followed by propidium bromide second staining. Flow cytometry was used to detect the death rate of target cells (HepG2 cells). The in vitro experiments were repeated for 3 times. The experimental data were analyzed by statistical software package SPSS13. 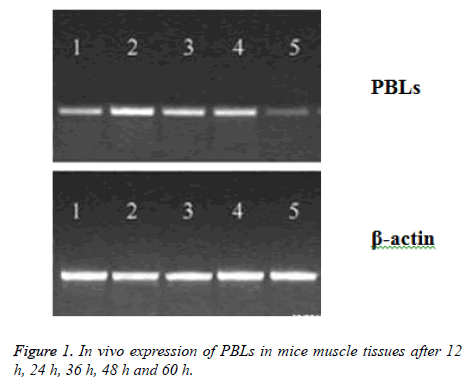 PBLs plasmid was injected into the muscle of mice, and the expression of PBLs mRNA was detected in muscle tissue after 12 h, and the peak value reached to peak at 24-48 h, which could not be detected after 60 h (Figure 1). After inoculation for 12 d, the average tumor weight (0.84 g) of PBLs group was less than that of pcDNA group (1.57 g) and normal saline group (1.61 g), which has significant difference (P<0.05). However, there was no significant difference between pcDNA group and normal saline group, suggesting that the expression of PBLs could be inhibited by gene transfection in T cells, which could probably inhibit the growth of tumor cells. Figure 1: In vivo expression of PBLs in mice muscle tissues after 12 h, 24 h, 36 h, 48 h and 60 h.
After the 5th day of inoculation, IL-2, IFN-γ and HSP70 of saline group and pcDNA group only exhibited trace expression, while the PBLs group displayed the expression of all three genes. 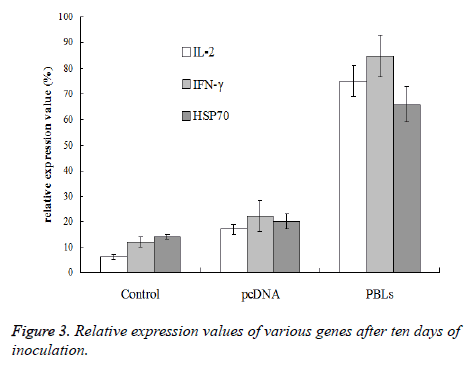 The expression of IFN-γ was higher than IL-2, while the expression of HSP70 was significantly lower than the other two genes (Figure 2). Figure 2: Relative expression values of various genes after five days of inoculation. After the 10th day of inoculation, the expression of IL-2 and IFN-γ in PBLs group did not show further increase comparing with the results obtained above. However, the HSP70 expression in normal saline group, pcDNA group and PBLs group was all enhanced (Figure 3). Therefore, it can be concluded that PBLs can promote the expression of positive immune related genes in the early stage of tumor growth. Figure 3: Relative expression values of various genes after ten days of inoculation. After inoculation for one week, the spleen cells were taken for proliferation experiment. Under the conditions of adding specific antigenic peptide stimulation and without specific antigenic peptide stimulation, flow cytometry was used to detect the mice splenocyte proliferation index of each experimental group. The results (Figure 4) showed that the PBLs group had significant difference (P<0.05) comparing the saline control group and the pcDNA group with specific antigenic peptide stimulation. Also, the mice splenocyte proliferation index of the PBLs group without specific antigenic peptide stimulation did not have significant difference comparing the other two groups. The ratios of proliferation index obtained by adding specific antigenic peptide stimulation and without specific antigenic peptide stimulation for the three groups were 0.97, 0.99 and 1.62, respectively. This result indicates that the larger the ratio is, the higher the activity of spleen cell proliferation is under antigen stimulation. Figure 4: Splenocyte proliferation index of three groups detected by flow cytometry. The killing activity experiment of spleen cells further confirmed the specific killing activity of T cells. The specific killing function of PBLs group was stronger than pcDNA group (P<0.05) and saline control group (P<0.01). The killing rate was 32%, 23% and 14%, respectively. Two-color analysis of the expression of PBLs on mouse spleen B cells was shown in Figure 5. BALB/c splenocytes were simultaneously stained with KM mouse anti-mouse IgM (a) mAb DS-1 and purified anti-mouse PBLs mAb 1D3. The staining of primary antibody was detected with FITCconjugated goat anti-rat lg. Figure 5: Flow cytometry (FACS) image for PBLs. In vivo expression of HSP70 and PBLs in mice muscle tissues after 5 h, 10 h, 15 h, 20 h, 25 h, 30 h, 35 h and 40 h were shown in Figure 6. Western Blot used denaturing Polyacrylamide Gel Electrophoresis (SDS-PAGE) for separation of protein mixture; the proteins were transferred to solid supports after separation and solid phase carrier absorb protein with non-covalent interaction, which maintains the invariant properties of antigen protein or polypeptide onto membrane. Solid carrier protein or polypeptide behave as antigen and react with its corresponding antibody and enzyme labelled antibody to detect the expression of specific proteins through chromogenic substrate. Figure 6: In vivo expression of HSP70 and PBLs in mice muscle tissues after 5 h, 10 h, 15 h, 20 h, 25 h, 30 h, 35 h and 40 h.
So far, we have demonstrated that transfection of PBLs into tumor-bearing mice significantly inhibited the growth of tumor. Furthermore, the growth was further inhibited when PBLs and HSP70 were simultaneously transfected. After inoculation for two weeks, of the average weight of tumor was only 0.42 g, significantly lower than that of PBLs transfected mice (0.84 g) or HSP70 transfected mice (1.57 g) and normal saline group (1.61 g). The experimental group treated with combined PBLs and HSP70 has significant difference (P<0.05), suggesting that PBLs and HSP70 have stronger synergistic antitumor effect. So far, PBLs has been used as the receptor molecule on the surface of T3 cells in the studies of membrane-type PBLs [5-7]. Generally, HSP70 is considered as the ligand of PBLs [8,9]. The signal produced by synergistic effect of HSP70 and membrane-type PBLs can prevent the activation of the cell and negatively regulate the cell immunity. However, if membranetype PBLs inhibits receptor only, soluble PBLs should enhance the immune response by blocking effect. Previous studies have found that soluble PBLs does not produce an immune enhancing effect, but generates an immunosuppressive effect [10-12]. In addition, some studies have found that membranetype PBLs is not only expressed on the surface of cells, but also on the surface of other tissue cells, including tumor cells [13,14]. The function of expression of membrane-type PBLs in these cells is unclear. However, all these studies suggest that PBLs might have multiple biological effects. In this study, it was found that T cells can enhance the immune function by transfecting the recombinant membrane-type PBLs eukaryotic expression plasmid into HepG2 hepatoma cells of vaccinated mice, which had significant antitumor effect. This result is not consistent with a previous publication which reported that membrane-type PBLs can induce T cell immune tolerance. The membrane-type PBLs is a receptor of the T cell surface, after binding with ligand for signal transduction, PBLs produced a series of changes within the cell. In current work, intramuscular injection of recombinant carrier of membranetype PBLs was directly conducted; this carrier effectively expressed in muscle cells but was difficult to transfect T cells. The possibility that membrane-type PBLs as cell surface receptor expression in mature muscle cell surface to induce the produce of positive immune effect by muscle cells is very small. Another possibility is that the membrane-type PBLs have ligand properties, which produced positive immune regulatory effect through the interaction with receptor of immune cells surface. Because only HSP70 molecules are known to bind with membrane-type PBLs, the existence of other receptor molecules remains unclear. In this research, the method of local transfection was taken to allow the expression of membrane-type PBLs only in specific position-the thigh muscle cells of KM mice. The free cells that can contact membrane-type PBLs or even generate biological effects include macrophages, T cells, B cells and granulocytes [18,19]. We speculate that in this case the membrane-type PBLs may not have a direct effect on T cells, but indirectly activate T cells via activation of macrophages or antigen cells. Because HSP70 that combined with PBLs can express in a variety of tissue cells including macrophages, the PBLs molecule will react with these cells. The RT-PCR results obtained with pure HepG2 cell samples showed very weak expression of HSP70 only, the possibility that PBLs molecules reacted with the HepG2 cells locally inoculated can be excluded. In this study, we have found that the membrane-type PBLs and HSP70 could have synergistic effect. HSP70 as a molecule having clear physiological functions can interact with its receptor (expressed on the surface of activated T cells) to maintain the activity of T cells or further enhance the activity and turn it into memory T cells. The transformation is independent and not restricted by other molecules, suggesting that the mechanisms of membrane-type PBLs signal is activation of T cells eventually, and produce synergistic effect with HSP70 based on the activation. After 2 weeks of tumor cells inoculation, HSP70 molecule started to function. Although there is T cells activation at this moment, the effect of PBLs molecules is not further strengthened, suggesting that PBLs molecules do not influence the functions of T cells after activation. Wu GY,Wu CH. Evidence for targeted gene delivery to Hepg2 hepatoma cells in vitro. Biochem 1988; 27: 887-892. Wilkening S, Stahl F, Bader A. Comparison of primary human hepatocytes and hepatoma cell line hepg2 with regard to their biotransformation properties. Drug MetabDisposBiolFate Chem2003; 31: 1035-1042. Kawata K, Osawa M, Okabe S. In vitro toxicity of silver nanoparticles at noncytotoxic doses to hepg2 human hepatoma cells. EnvironSciTechnol 2009; 43: 6046-6051. Tacchini L, Dansi P, Matteucci E, Desiderio MA. Hepatocyte growth factor signalling stimulates hypoxia inducible factor-1 (Hif-1) activity in hepg2 hepatoma cells. Carcinogen 2001; 22: 1363-1371. Zegura B, Sedmak B, Filipic M. Microcystin-lr induces oxidative DNA damage in human hepatoma cell line hepg2. Toxicon 2003; 41: 41-48. Puga A, Maier A, Medvedovic M. The transcriptional signature of dioxin in human hepatoma hepg2 cells. BiochemPharmacol 2000; 60: 1129-1142. Mee CJ, Harris HJ, Farquhar MJ, Wilson G, Reynolds G, Davis C.Polarization restricts hepatitis c virus entry into hepg2 hepatoma cells. JVirol 2009; 83: 6211-6221. Bae MA, Song BJ. Critical role of c-jun n-terminal protein kinase activation in troglitazone-induced apoptosis of human hepg2 hepatoma cells. MolPharmacol 2003; 63: 401-408. Schütt M, Meier M, Meyer M, Klein J, Aries SP,Klein HH. The hiv-1 protease inhibitor indinavir impairs insulin signalling in hepg2 hepatoma cells. Diabetol 2000; 43: 1145-1148. Alía M, Ramos S, Mateos R, Granado-Serrano AB, Bravo L, Goya L.Quercetin protects human hepatoma hepg2 against oxidative stress induced by tert-butyl hydroperoxide. ToxicolApplPharmacol 2006; 212: 110-118. Martín-Renedo J, Mauriz JL, Jorquera F, Ruiz-Andrés O, González P,González-Gallego J. Melatonin induces cell cycle arrest and apoptosis in hepatocarcinoma hepg2 cell line. J Pineal Res 2008; 45: 532-540. Paolicchi A, Tongiani R, Tonarelli P, Comporti M, Pompella A. Gamma-glutamyltranspeptidase-dependent lipid peroxidation in isolated hepatocytes and hepg2 hepatoma cells. Free Radical BiolMed 1997; 22: 853-860. Pratt WB, Gestwicki J E, OsawaY, Lieberman AP. Targeting hsp90/hsp70-based protein quality control for treatment of adult onset neurodegenerative diseases. Ann Rev PharmacolToxicol 2015; 55: 353. Behnke J, Hendershot LM. The large hsp70 grp170 binds to unfolded protein substrates in vivo with a regulation distinct from conventional hsp70s. JBiolChem 2014; 289: 2899. Bracher A, Verghese J. Grpe, hsp110/grp170, hspbp1/sil1 and bag domain proteins: nucleotide exchange factors for hsp70 molecular chaperones. Sub-Cell Biochem 2015; 78: 1-33. Sakaguchi S, Sakaguchi N, Asano M, Itoh M, Toda M. Immunologic self-tolerance maintained by activated t cells expressing IL-2 receptor alpha-chains (cd25). Breakdown of a single mechanism of self-tolerance causes various autoimmune diseases. JImmunol 1995; 155: 1151-1164. Sakaguchi S, Sakaguchi N, Asano M, Itoh M, Toda M. Pillar’s article: immunologic self-tolerance maintained by activated T cells expressing IL-2 receptor α-chains (cd25). Breakdown of a single mechanism of self-tolerance causes various autoimmune diseases. J Immunol 2011; 186: 3808-3821. Chinnadurai R, Copland IB, Patel SR, Galipeau J. Ido-independent suppression of T cell effector function by IFN-γ-licensed human mesenchymal stromal cells. J Immunol 2014; 192: 1491-1501.